After the previous two steps, you have an integration service that communicates with WordPress in both directions. The next step is to wire this up with Zendesk Support so it knows where the integration service is and what capabilities the integration service has. Integration services are self-describing. They expose a manifest which describes their attributes and capabilities in JSON. The manifest includes the name, globally unique id, author, version, and a list of all reachable endpoints on the integration service. This returns the manifest JSON. The endpoints you built in steps 2 and 4 are described in pull_url and channelback_url respectively. Now you can verify manifest endpoint works with curl. You have now built the necessary API endpoints for the Channel framework to interact with the integration service. However, the integration service doesn’t have a way for the Zendesk Support admin to provide WordPress login information. Now you are going to build the UI to collect the WordPress information from the Zendesk Support administrator. Zendesk Support will store this information in an integration account. In the Channel framework, an integration account records information about an instance of the origin service. For example, an integration account for WordPress integration service stores connection information for a WordPress login. Note : The warning message and surrounding decorations are implemented in Zendesk Support. 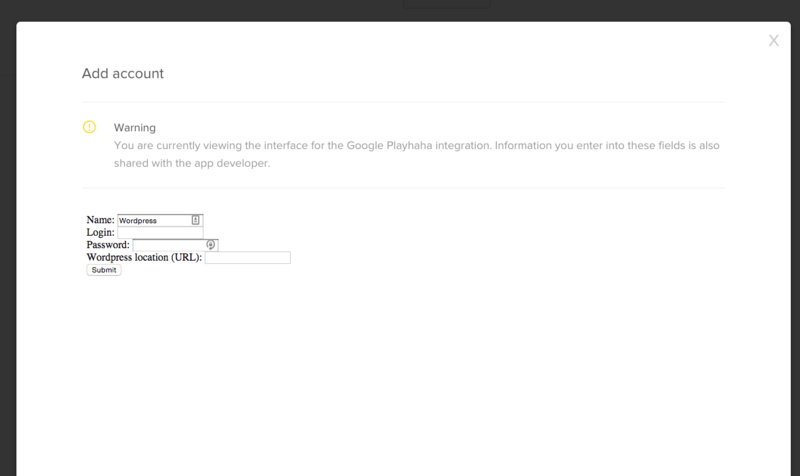 Only the form is implemented in the integration service. First, implement the admin UI form. This function returns the HTML for the input form as seen in the screenshot. When the administrator is editing a pre-existing account, this form displays the previous values for name, login, and password. Therefore, this page can handle both creating new integration accounts and editing existing ones. Lines 8, 10, 14, and 18 are examples. Zendesk Support provides a return_url when displaying the admin UI. Once the administrator has POSTed the form to the integration service, it will format the data according to Zendesk Support’s requirements and POST it back to Zendesk Support via the the return_url. On line 10, the code sets the target of this form to ./admin_ui_2 for subsequent processing. After the Zendesk Support administrator enters the WordPress information, the integration service needs to save the information to use in future pull and channelback requests. Instead of storing this information local to the integration service, the Channel framework provides a simple way to store it inside Zendesk Support. The return_url mentioned above is the mechanism to store metadata in Zendesk Support. // Request to WordPress was successful- did we find the user? // into a form and then programmatically submitting the form. // them to edit the connection info. On line 2, this function calls the WordPress API to retrieve user info. This verifies the WordPress user information provided by the admin. See the userRequestOption function for more information about the request parameters. Lines 9-69 handle the response we get from WordPress. If the code finds the user, it knows the login is working. Line 30-36 combines all the login information into a JSON string (the metadata). Then in line 39-55, it passes the formatted information back to Zendesk Support, using a http form POST to the return url. This metadata is similar to what you used to test the pull and channelback endpoints. If the code encounters any other errors, line 59-66 re-renders the admin_ui form with error Sorry, we were unable to connect to WordPress at the requested location, please try again. Note : For ease of use and testing in this tutorial, the integration service uses basic authentication with an unencrypted password. This is not recommended for a production integration service. Continue on Channel framework startup tutorial - Step 6: Connect the integration service to Zendesk Support - Part 2 (Zendesk app) .